What are the best approaches for addressing children’s weight problems? Researchers are looking to families for solutions that have succeeded. September 2017—As PCORI-funded studies produce results of interest to patients and those who care for them, we are updating the stories of those projects. The article below was published in May 2015. You can read an update to this story here. When seven-year-old Kiara’s weight continued to climb beyond the normal range, Mannone took action. She encouraged her daughter to choose healthful snacks like carrots, instead of potato chips, and to play sports and dance. At the same time, Kiara herself became motivated to embrace more healthful choices. She had been bullied at school because of her weight and was frustrated that she couldn’t wear some of the clothing the other girls were wearing. All along, Mannone worked to maintain her daughter’s self-esteem and focus on being healthy, rather than zeroing in on the weight itself. “I reassure her every day that she’s beautiful. But I also asked her ‘Do you want to be healthier?’” When Kiara said “Yes,” Mannone asked her what she could do. Kiara suggested healthier snacks. Mannone also proposed more exercise, and Kiara agreed she could do that, too. And indeed, Kiara’s weight soon began to drop, and she has kept her weight at a healthier level for more than a year. The successful approaches devised by Mannone and her daughter led Kiara’s pediatrician at Harvard Vanguard Medical Associates to refer them to researchers who were embarking on a novel PCORI-funded project. 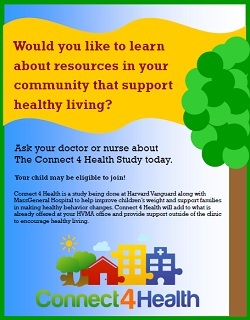 Called Connect 4 Health, the project based at MassGeneral Hospital for Children (MGHfC) aims to reduce childhood obesity. 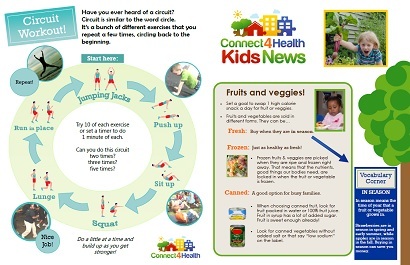 Clinicians from Harvard Vanguard’s pediatric offices are part of the Connect 4 Health study team. Rather than taking the usual approach, where researchers test interventions that they think might be effective, the Connect 4 Health team began by seeking answers from patients, clinicians, and the community. The team, led by Elsie M. Taveras, MD, MPH, Chief of General Academic Pediatrics at MGHfC, examined electronic health records from 2008 to 2012 to identify children with obesity, ages 6–12, who had successfully improved their body mass index (BMI) or stopped excessive BMI gains. To find out what approaches had worked, the researchers then conducted focus groups, four with a total of 21 children and five with a total of 41 parents and other caregivers. Connect 4 Health targets families who live in “hot spots”—zip codes in which more than 15 percent of children have obesity. “We wanted to know how some families are able to succeed in ‘obesogenic’ environments, that is, those that normally foster higher-than-normal body mass index in children,” says Taveras. 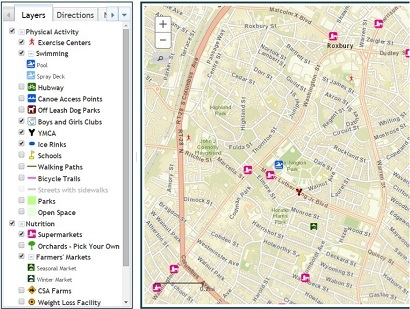 In these zones, it can be difficult to find or afford healthful food or safe places to exercise. “We are hoping to help families identify where they can make changes and what strategies and resources are available in their communities,” says project manager Christine M. Horan, MPH, of MGHfC. For example, Avalon says, “we talked about culturally appropriate recipes prepared in a healthier way: brown rice instead of white, leaner meats, and smaller portions of meats.” Group members also shared information on community resources, such as free physical activity programs at recreation centers and YMCAs. Using such feedback from the so-called “positive outliers,” who had managed to buck the obesity trend on their own, the researchers are now testing an intervention that targets several key behaviors using various family-centered approaches to reduce childhood obesity. Weight loss per se is not a goal because the children are still growing. But the researchers will find out whether the BMIs of the children who receive the intervention go down compared with those of children whose healthcare providers follow the standard approach. Recruiting from Harvard Vanguard pediatric offices, the research team has enrolled 721 parent-child pairs. Half will continue to get only their usual care, while the others will also receive the intervention informed by feedback from the positive outliers, such as Mannone and her daughter. Some of the approaches the two came up with are now formally part of the study’s health-coaching sessions. These include engaging the child in decision making, focusing on being healthy instead of losing weight, boosting the child’s self-esteem, encouraging physical activities the child finds fun, and establishing rules about snacking. Trained health coaches will work with the families in five sessions over a year to help them determine where they can make changes to achieve each of the target behaviors and to maximally leverage their community resources for behavior change support. Each child will receive a final assessment at his or her annual physical. In addition to participating in the parent focus groups, Mannone is now a member of the parent advisory group. She is providing input into the best ways researchers can communicate with families and help them overcome barriers. Parent-advisor suggestions have been, for example, incorporated into how the researchers deliver their intervention, such as using video-conference and phone options as alternatives to in-person visits. Goal: To design and test a new clinical program for improving health care of children who are overweight by learning from children—and their families—in disadvantaged communities who have succeeded in achieving a healthier weight.